Upon your retirement from active service at your own request, I take pleasure in expressing to you the appreciation of the War Department of your long and valuable service, extending over a period of more than thirty-nine years. A review of your military career shows outstanding accomplishments and high professional attainments. The records show that you graduated from the South Carolina Military Academy in 1896, and were appointed a Second Lieutenant, 19th Infantry, on July 9, 1898. Shortly after being commissioned in the Army you sailed for Puerto Rico and joined your regiment, serving at Ponce and at Adjuntas to May 15, 1899, when you returned to the United States for a tour of duty at Camp Meade, Pennsylvania, to July 17, 1899. Labangon Barrio - July 27, 1901, where you were wounded. You accompanied General Hughes back to the United States in December, 1901, and served as his Aide at Washington, D. C., to March 22, 1902, and at Headquarters, Department of California, to April 1, 1903. You then joined the 19th Infantry at the Presidio of San Francisco, California, where you remained until August 10, 1903. Having been detailed as a Student, General Service and Staff College, Fort Levenworth, Kansas, you graduated therefrom June 27, 1904, following which you were assigned to the 2nd Infantry at Fort Logan, Colorado, serving with that regiment until December 1, 1904. Subsequently you rejoined the 19th Infantry at Vancouver Barracks, Washington, and served at that station until April 1, 1905, before being again ordered to the Philippine Islands, where you served at Parang and Cudarangan, Mindanao, to October 13, 1906; and at Camp Vicars to June, 1907. Upon your return to the United States you were assigned to duty at Fort McIntosh, Texas, to January 29, 1910, part of which time, during the period July 20th to September 1, 1909, you served on duty in connection with the Southwestern Rifle Competition and National Matches. You were again ordered back to the Philippines in February, 1910, where you served at Warwick Barracks, Cebu, to May 5, 1919 [probably supposed to be "1911"]; at Camp Jossman, to January 3, 1912,; and at Fort William McKinley, to May 15, 1912, when you returned to the United States, serving at Fort Sheridan, Illinois, until January 2, 1913; and on General Recruiting Service, Boston, Massachusetts, during the period January 16, 1913, to November 3, 1915. Joining the 26th Infantry on March 3, 1916, you served on Border Patrol at Harlingen, Texas, to March 1, 1917, part of which time, form August 8, 1916, to March 1, 1917, you were Inspector-Instructor of the National Guard; and at San Benito, Texas, commanding Company and 2nd Battalion, from April 26th to June, 1917. On June 14, 1917, you sailed for France and commanded the 2nd Battalion, 26th Infantry, American Expeditionary Forces, to August 31, 1917, when you returned to the United States and were assigned to duty at Camp Devens, Massachusetts, where you served with the 76th Division, in charge of Division School and Reserve Officers' Training Corps to June 20, 1918. Subsequently, you were in charge of instruction, Infantry Replacement Training Camp, Camp Mac Arthur, texas, to September 22, 1918; commanded the 95th Division to October 23, 1918; commanded the 308th Infantry, Camp Sherman, Ohio, to January 11, 1919; Executive Officer, Camp Custer, Michigan, to May 30, 1919; Executive Officer, Camp Meade, Maryland, to August 12, 1919; detailed as Student Officer to the School of the Line, Fort Levenworth, Kansas, from which you graduated on June 26, 1920; and attended the General Staff School at Fort Levenworth, to June 30, 1921. After graduation, you remained at the latter named school to August 7, 1923, as an Instructor. You were then detailed as a Student Officer to the Army War College, Washington, D. C., and upon graduation therefrom on June 30, 1924, were assigned to duty as Commanding Officer, Fort Hamilton, New York, and Overseas Discharge and Replacement Depot, to August 24, 1926. After completing the Refresher Course at the Infantry School, Fort Benning, Georgia, in December, 1926, you assumed command of the 16th Infantry and Post of Fort Jay, New York, where you served until June 26, 1928. 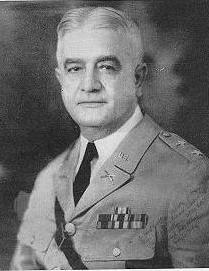 You then became Assistant Chief of Staff, G-3, Training and Operations Division, War Department General Staff, Washington, D.C., to June 15, 1932; and then took command of the 10th Infantry and Fort Thomas, Kentucky. From the date of your appointment you steadily advanced in rank, and, on May 24, 1935, recognition was given to your ever increasing achievement, and you were honored by being selected and appointed Chief of Infantry, with the rank of Major General. You joined the Army Group, Washington, D. C., May 1937, and proceeded on leave of absence June 12th, pending your retirement. Silver Star - Citation for which reads: "For gallantry in action against Insurgents near Cebu, P. I., on July 27, 1901. During the engagement Lieutenant Croft was seriously wounded, but in spite of his wound he retained command and coolly directed the action of his troops until a senior officer arrived with reinforcements." Purple Heart - on account of wound received in action July 27, 1901, while serving as a First Lieutenant, 19th Infantry. Through the many years of your service, your professional attainments, sound judgment and other sterling soldierly qualities have won the approbation of those with whom you have served. As you now pass from the active to the retired list, I feel that in wishing you many years of happiness, I express not only my personal sentiment, but also that of your many friends throughout the military establishment. Croft's father, Colonel Edward Croft, 1836-1892, was also a Citadel graduate, class of 1856, and a Confederate Army officer. He served as field commander, 14th S. C. Reg't, McGowan's Brigade and was wounded in Battle of Gettysburg.